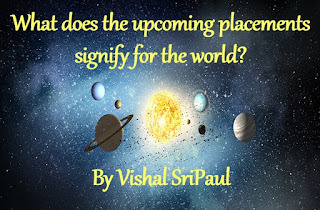 Uncategories What does the upcoming placements signify for the world? 1. It shall bring about the dictatorial and aggressive nature of the people in authority specially of the people who are pretending to be spiritual but are faking like the wolf in the lamb skin. 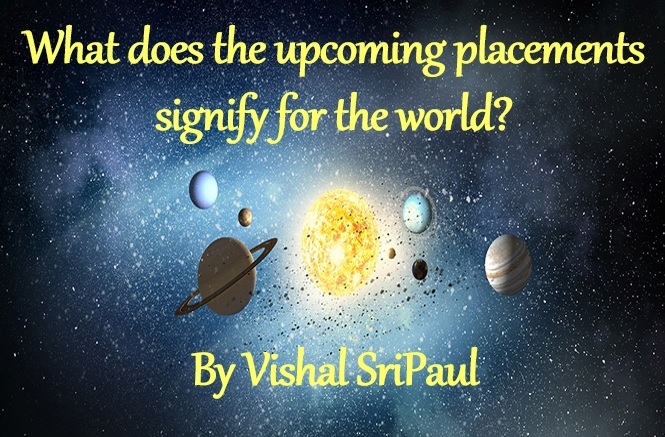 They will get exposed during this period and false practices shall come up on the surface; many will run away to safeguard their self from this. At the same time, with this even the righteous people too shall face defamation which is a testing period for them. But, truth alone triumphs. 2. There shall be an increase in the hidden activities by the terrorists and there is also a great fear of mass bombings as well as attacks on the common public. 3. There shall happen the derailments of trains specifically, in India and East Asia, which shall cause loss to the governments but only few will lose their lives. 4. Bharat economy will face lows and common public will suffer because of money crunch. The inflation shall rise further and making it totally difficult to manage resources. Also, the government shall face challenges posed by opposition and riots too are possible involving fires. 5. There will be sudden drop in temperature as the cold winds begin to flow from north- west. At the same time, there shall be natural calamities which include earthquake in the north-east asia, nepal and eastern states in Bharat. 6. There shall occur some secret captivation of people in the countries like Western Europe and US; which will also be revealed to the public as Jupiter progresses in the sign. 7. There shall be news about the fall of tall buildings and bridges in the developed countries, which shall cause loss of many lives. 8. The secret missions like the invasion of extra-terrestrial beings will also come in front of the public and countries from EU and Britain will be found involved in this. So, this is about the upcoming gruha influences and now, the question is "will there be any good too or just all bad?" Yes, there will be good things happening too, which will bring glories to our country and humanity consciousness will rise too. Stay Safe, Live Natural, Stay Healthy.